Senior outside hitter Katie Evans spikes the ball over the net during the game against Stevenson University. 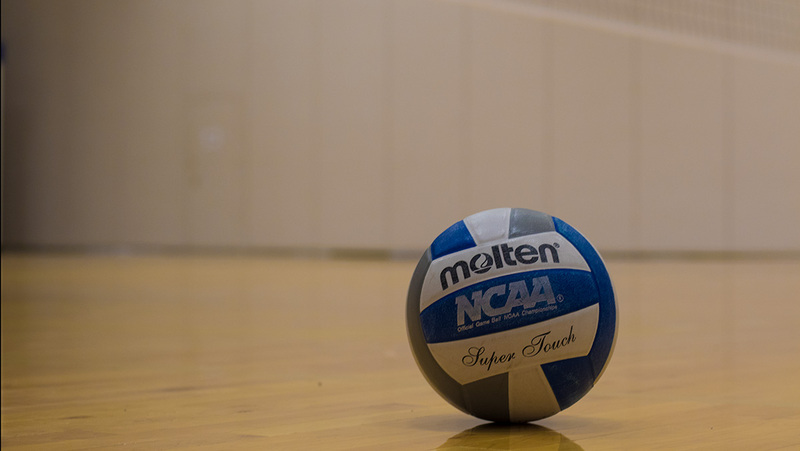 The Ithaca College volleyball team advanced to the Round of 16 after defeating Stevenson University 3–0 Nov. 10. The Bombers got scoring started in the first set with a kill from sophomore outside hitter Reagan Stone to take a 1–0 lead. In the first set, the score was tied 11 different times. At 23–23, senior middle hitter Katie Evans had a kill to push the Blue and Gold ahead 24–23. With an attack error on Darian Hileman, Stevenson junior outside hitter, the South Hill squad took the set 25–23. The Mustangs outscored the Bombers in kills 10–9. Stevenson had nine attack errors while the Blue and Gold had eight. In the second set, the South Hill squad won with a score of 25–21. Hileman had a ball handling error, giving the Bombers a 1–0 lead to start the game. Halfway through the second set, the Blue and Gold found themselves down 12–6 after a service ace by Hileman. The Bombers began to close the lead with a four-point streak to put themselves down 13–11. Stone delivered a kill to die the game at 21. After that, the Bombers scored four straight points to clinch the victory. In the final set, Hileman had an attack error to put the South Hill squad up 1–0. The Mustangs went on to score three straight points to take the lead 3–1. Leading 13–12, the Bombers scored seven straight points to extend the lead to 20–12. The South Hill squad clinched the victory at 25–17. Stone finished with 12 kills while senior Katie Evans finished with nine. The Bombers are back in action against Carnegie Mellon University for the Round of 16 at 2 p.m. Nov. 11 at Ben Light Gymnasium.